The installation at Ancient and Loyal Lodge of Installed Masters No 9762 is always a grand affair, with the great and good listed amongst its membership and regular visitors. This event was no exception. David Winder (left) congratulates Andy Baxendale on attaining the WM’s chair. 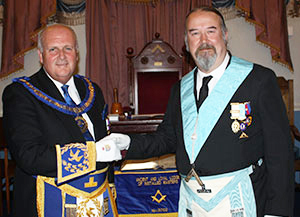 Mike Turrisi WM conducted the initial business of the lodge and welcomed the principal and distinguished guests with a bit of a twist. The principal guest for the occasion was Assistant Provincial Grand Master David Winder and he would normally have taken the salute to the master, then been offered the gavel of the lodge. On this occasion, however, newly appointed APrGM David Ogden, who has responsibility for the Wigan Group, is a member of the lodge and this was his first visit since his appointment. Protocol therefore dictated that this honour be given to the local APrGM, following which, he handed over to his colleague to take his place as principal guest for the remainder of proceedings. Both were accompanied by grand officers including Mark Dimelow together with group chairman Geoffrey Porter, Danny Jones, Malcolm Taylor and Graham Hughes, supported by group officers John Selley and Chris Reeman. Also present were recently appointed acting Provincial grand officers Barry Dickinson Provincial Junior Grand Warden and Eric Bailey Provincial Senior Grand Deacon. Mike then proceeded to install his successor Andy Baxendale, in fine style. David Winder was treated to a wonderful ceremony, with a confident and dignified performance from Mike, assisted by members of the lodge. The working tools were presented in fine fashion by Mike Turrisi, Ian Green and David Rigby, who then went on to give the address to the new WM. Barry Dickinson gave the address to the wardens and David Winder in turn, delivered the address to the brethren of the lodge. Following the ceremony, David brought the greetings of the Provincial Grand Master Tony Harrison, who he said would have been delighted to witness such a fine installation and on his behalf both thanked and congratulated Andy on attaining the chair of this fine lodge. He also made special comment on the quality of the ceremony he had just witnessed and congratulations were also given to the brethren who had presented the working tools. In reply, David was grateful to receive charitable donations from Andy on behalf of the lodge members, consisting of three cheques for £100 each in favour of the three Masonic halls in the group and a further cheque for £350 to the Grand Charity as a donation to the MCF 2021 Festival which obviously David, as Festival Chairman, was very grateful. Andy Baxendale (centre left) with fellow stars from the TV programme ‘The Sweet Makers’. A fine and well attended festive board followed. David was keen to bring his own congratulations to Andy and all who took part in the ceremony, as well as to the group and acting officers present. He congratulated those who had received appointments and promotions and also the DC and ADC, Keith and John Lomax. David delivered a number of messages, serious but infused with humour and was really keen to spread the word of the importance of the MCF 2021 Festival. Now for an explanation of why this installation is a ‘sweet succession’. Andy Baxendale is a confectioner, operating as ‘the sweet consultant’. 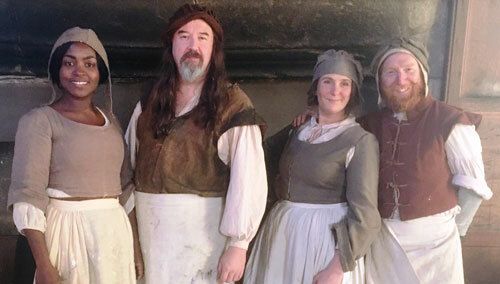 He starred in ‘The Sweet Makers’ aired on BBC 2 where Andy and three other modern-day confectioners got to use original recipes to recreate Tudor and Georgian delicacies as well a Victorian sweet shop in the final episode. The programme was a big hit and since appearing, Andy has been in great demand by the media, putting Wigan on the confectionary map. Andy is a member of Ancient and Loyal Lodge of Installed Masters as well as Ashton Trinity Chapter No 8821 in the Wigan Group and also a member of Hardshaw Lodge No 8722 in St Helens. Andy is a prominent force behind transforming Skelmersdale Waterloo Chapter No 1380, which has been adopted into the Wigan Group, into a new ‘Bikers’ Chapter’, which meet at Bryn Masonic Hall on two Saturday mornings in September and May. Andy is also the President of the North West Chapter of the Widow’s Sons Masonic Bikers’ Association. Pictured from left to right, are: Barry Dickinson, John Selley, Geoffrey Porter, Danny Jones David Ogden, David Winder, Andy Baxendale, Mike Turrisi, Mark Dimelow, Malcolm Taylor, Graeme Hughes, Eric Bailey and Chris Reeman.